Peach facts, an information sheet for kids cooking activities. 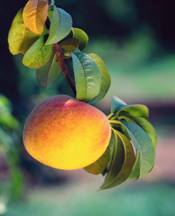 Peach facts and general information about peaches which includes nectarines. Peaches are available fresh July August. They are also available year round frozen or canned. Peaches grow on trees like apples or pears. Avoid spots or bruises on peaches. If ripe they should yield slightly when pressed. Nectarines have the same qualities with smooth outer skin. When ripe store in fridge. To ripen, leave out at room temperature. Blanch peaches to remove skin by placing in boiling water for 2 minutes and then placing in cold water. This will cause the skin to peel right off. Bake in fruit dishes, freeze, can, dry or eat as is. One medium peach is one serving. It is full of Vitamin C, Vitamin A, Vitamin K, Vitamin B6, potassium, magnesium, calcium and iron. Put 1 stick of butter in casserole dish and place in a 350 degree oven until melted. Remove casserole dish from oven and pour in batter. Add 4 Cups sliced peaches. Bake at 350 degrees for 40 minutes or until brown. Combine all ingredients in a large jug or bowl. Slice 4 of the peaches very thin and set aside. Place the remaining peaches into the blender. Add the cottage cheese and process until well blended. Add in the cream cheese and Splenda and blend until smooth. 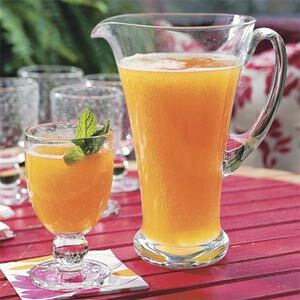 Spoon the mixture into 4 serving cups and garnish with the reserved peach slices. Back to Food Facts from Peach Facts.